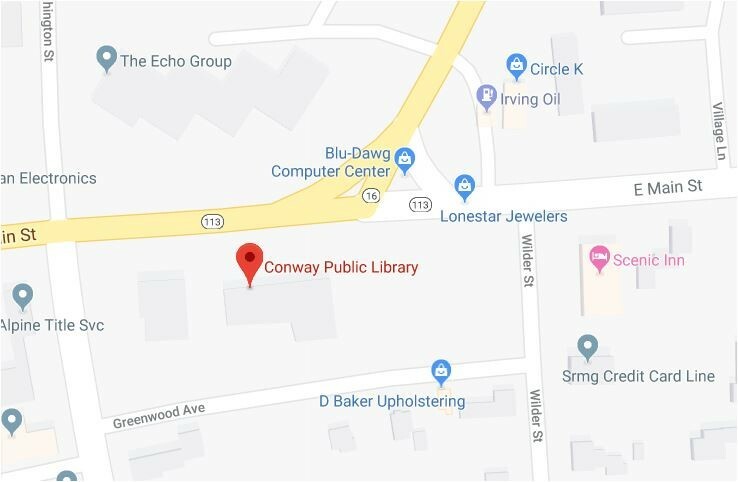 The Conway Public Library is here to help you in-person, over the phone, and through the computer. We are located at 15 Greenwood Ave. Conway, NH 03818. The Library's main entrance and parking lot is only accessible from Greenwood Avenue. Parking in the library lot is limited. Additional 2 hour street parking is available along Greenwood Avenue as well as Washington Street. We are available by phone whenever the Library is open. Can't make it to the library? Feel free to use the form below to ask us any question you might ask at a public library reference desk. Need to speak with a specific staff member? Consider contacting them directly via e-mail.